The pictured tape in hair extensions is Hera 16 inches straight #10 medium color Malaysian virgin double needle tape in hair extensions, which is one updated hair products base on glue tape in hair extensions and one pack includes 40 pcs 4cm*0.8cm small pieces. 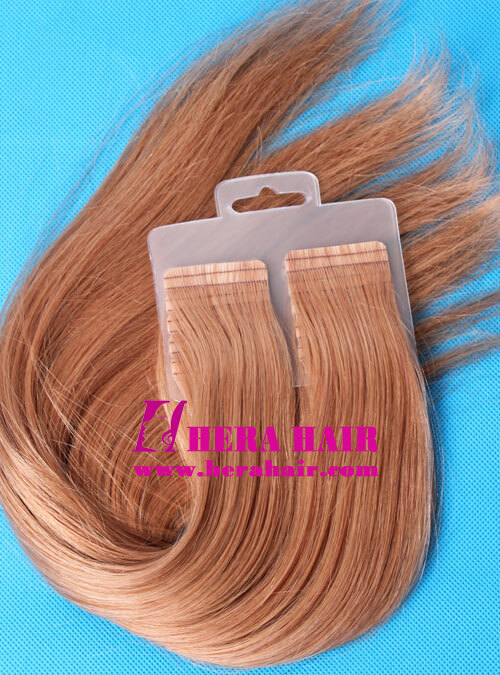 If you are doing tape in hair extensions wholesale business, or runing hair store or runing hair salon or even you are hair stylist, Hera welcome you contact us for wholesale Chinese virgin tape in hair extensions. Hera can supply aboved kinds of hair materials double needle tape in hair extensions and our double needle tape in hair extensions wholesale MOQ is only 10pcs, which our hair extensions is good ratio single drawn hair.